The September 2017 Greater Atlanta Coin Show welcomed visitors, especially those from Florida, on a beautiful day ahead of storm Irma. While Irma pounded southern Florida, the metro Atlanta area still had mostly sunny skies with some wind and temperatures in the low 70s. The hotel's parking lot had lots of vehicles with Florida plates, and we enjoyed seeing several of those visitors at the coin show. We saw the hotel also hosted several dogs escaping with their humans from the storm as well. Buzz on the bourse included discussions of the storm related gas shortages, empty grocery store shelves and early week bank closures already stated for the coastal areas of Georgia. We expect several of our missing regulars chose not to come due to those shortages in the nearby areas. We appreciate all of our visitors - new or returning, local or visiting the area - and hope you enjoyed the dealers' many displays. Of course, we also appreciate our dealers, our security and the hotel's staff for keeping the show going each month. Remember the ferroequinologist from the August notes? This month, our virtual tour includes a couple of items that might again interest the ferroequinologists along with coin banks, battlefield artistry, Confederate numismatics, mint error coins and modern centennial anniversary gold. Last month's notes included a Lionel model train. This month, a similar model train is highlighted on a Centennial Knife from Lionel. Searching on the internet found that Lionel did at least two different centennial knives, this one of the 671 steam turbine locomotive and another of the Santa Fe F3 Diesel locomotive. "This document certifies this knife is an official issue of the Lionel Centennial Knife Collection and limited to an edition size of 45 casting days. Commemorating the 100th Anniversary of legendary Lionel trains, this collector knife is available exclusively through Collector's Showcase. Licensed by Lionel LLC"
"A year of celebration and change. Lionel celebrates its Golden Anniversary by introducing the beautiful 24k Gold-Plated 700E J1E Hudson locomotive. "Lionel moves its 100 years of American manufacturing to Korea and China. The 100-year-old company had no choice if it was to remain competitive and the industry leader." 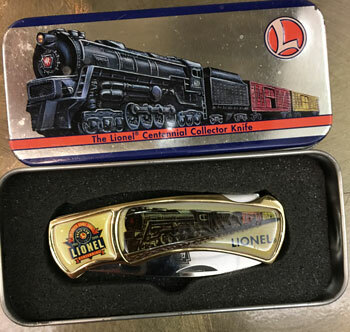 This particular collectible knife came in its own tin case showing the locomotive on the front, "The Lionel Centennial Collector Knife" and their logo. 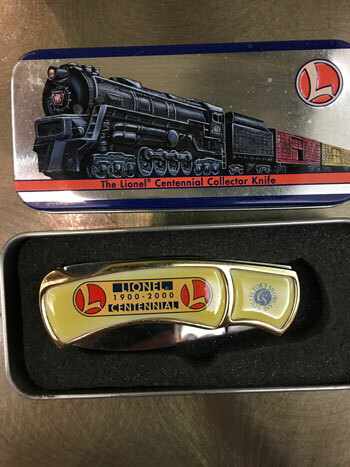 One side of the knife also shows the train's image with "Engineer some fun!," "Lionel Legendary," "1900-2000" and "Lionel Centennial" in an emblem near one end. The knife's other side shows "Lionel 1900-2000 Centennial" and "Collector's Showcase." On one side of the knife's blade is "671 Steam Turbine Locomotive" with its corresponding Pennsylvania Railroad emblem stamped in black. The other side shows "China" for its country of origin. As one web site commented, "Being a collector's knife, its edge is not sharpened." In other words, this is a pretty collectible but not for practical use. The next item on our tour is an example of scripophily, which is defined as the collection of old bond and share certificates as a pursuit or hobby. This specimen with date of July 1, 1934 is a General Mortgage 4 1/4% Bond, Series E for the Pennsylvania Railroad due July 1, 1984. With some magnification, the dots near the signatures show this certificate was canceled on 11 2 81 by 1ST PA. The bearer had waited this long, why not wait a few more years for maturity? 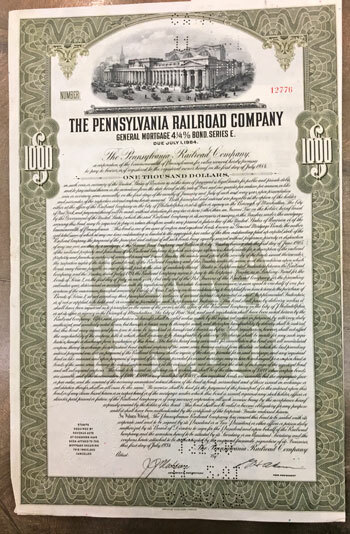 "The Pennsylvania Railroad Company, also known as the 'Pennsy,' was an American Class I railroad that was established in 1846 and headquartered in Philadelphia, Pennsylvania. "The PRR was the largest railroad by traffic and revenue in the U.S. for the first half of the 20th century. Over the years, it acquired, merged with or owned part of at least 800 other rail lines and companies. "At the end of 1925, it operated 10,515 miles of rail line; in the 1920s, it carried nearly three times the traffic as other railroads of comparable length, such as the Union Pacific or Atchison, Topeka & Santa Fe railroads. "At one time, the PRR was the largest publicly traded corporation in the world, with a budget larger than that of the U.S. government and a workforce of about 250,000 people. "The corporation still holds the record for the longest continuous dividend history. It paid out annual dividends to shareholders for more than 100 consecutive years. "In 1968, PRR merged with rival NYC to form the Penn Central Transportation Company, which filed for bankruptcy within two years. "The viable parts were transferred in 1976 to Conrail, which was itself broken up in 1999. The canceled bond does not easily provide the details of its value, but at least in 1981 some of its assets still existed. In the meantime, this canceled bond is just one of the many scripophily examples that can be found at the monthly coin show. This month the coin show hosted a coin bank enthusiast and dealer. He provided a wide variety of coin banks, some vintage and some from newer manufacturers. "A still bank describes any type of money box, strong box, or receptacle designed to receive and store coins. The most famous type of still bank is the piggy bank, which gets its name from an orange-colored clay called pygg, but many more still banks came in all sorts of shapes-from houses to bureaus to the busts of presidents. "Unlike a still bank, a mechanical bank is defined as a toy bank wherein a coin is deposited by a mechanical process. Some people also collect 'semi-mechanical banks,' whose features include ringing bells or the release of all collected small change once a certain amount has been deposited. The latter are known as 'registering banks.' Another collecting subset focuses on contraptions that were designed and developed but never made it to production-these are known as "conceptual banks." "Mechanical banks were first manufactured in the late 1800s, as the middle class emerged and grew in prosperity during the Industrial Revolution. Hence, the concept of earning and saving money became more and more important, particularly as a value to impart to children. At the same time, Victorian Era tinkerers were experimenting with mechanical technology, including spring-driven and windup devices." Oddly enough, mechanical banks were not just for the home. "You drop a penny in the slot, pull a knob-which cannot refuse to work so long as the bank is not yet full-and a receipt for your penny is ejected upon a tray. You may, of course, deposit a number of pennies, receiving a receipt for each. "The coins fall flat into a tube, with a number opposite every deposit, and a corresponding number appears upon the receipt, so that confusion or fraud is impossible. "This receipt will also have printed upon it the name of the collector, the exact locality of the machine, and the address of the head office where payments are made and interest added. Spurious coins will operate so far as securing the receipt is concerned, but if a fraud is perpetrated it will be instantly detected when the receipts are presented. "At the beginning of the new year 1,000 of these neat red-painted mechanical banks were put up in London - adjacent to stations, factories, etc., -- and about 20,000 all over the country." Coin banks, whether still or mechanical, provide insights into history, and their variety is almost endless. Like coins and antiques, their value depends on several different components from their age to their condition to their rarity to their desirability to name a few. This next piece shows an artist's depiction of a Civil War battle. This is a page from the 1928 book titled Battlefields in Dixie Land and Chickamauga National Military Park, compiled by Nashville Chattanooga St. Louis Railway, Western and Atlantic Railroad. The book includes the descriptions of the key battles fought along the rail lines during the US Civil War and the story of the infamous steam engine "General." The illustrations include pictures of Generals, maps, battle views, etc. These small booklets could have been handouts for the railway passengers traveling through these historic areas. The description at the bottom of this image reads, "Battle of Allatoona, Georgia at Allatoona Pass, on the Western & Atlantic Railroad, October 5, 1864. The message signalled from Kennesaw Mountain to these heights gave rise to the famous gospel hymn, 'Hold the Fort, for I Am Coming.'" 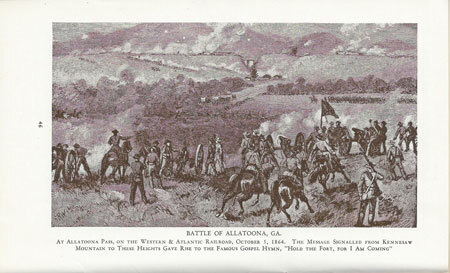 The Battle of Allatoona Pass is part of our history. Today, the battlefield, beside a beautiful lake, contains an interpretive walking trail that describes the events of that day. War plays havoc with government finances. 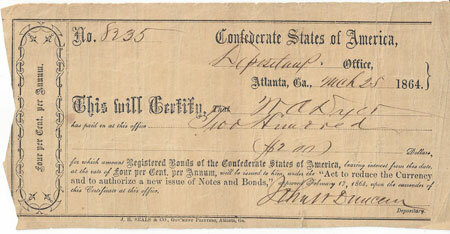 The Confederate states issued bonds to help fund the cost. "Under the Act of February 17, 1864, a new issue of notes was authorized that was printed in unlimited quantities (probably about one billion dollars). All earlier notes were to be retired after being funded into bonds by certain dates after which any remaining notes were to be taxed out of existence. Apparently this converse effort to reduce circulation was not too successful judging by the number of earlier issues still in existence. By this time the value of the Confederate dollar was so low that it didn't matter much whether one redeemed the notes in equally inflated bonds or not. Circulating side by side, one issue was worth as much as the other. "The 1864 bonds given in exchange for redeemed notes were not immediately available from the printers while at later time the supply of bonds at a given depository might be insufficient to equal the quantity of notes to be exchanged. To meet this exigency Section 2 of this Act provided for certificates to be given in lieu of bonds. These Certificates of Deposit could later be exchanged for bonds or could be used as a form of money in payment of taxes. These certificates come in several varieties..."
This particular certificate was printed by J. H. Seals & Co, Gov'ment Printers, Atlanta, Ga. as seen at the bottom of the document. It was number 8235 at the Depositary's office in Atlanta on March 28, 1864. It stated, "This will Certify That N. A. Dyer has paid in at this office Two Hundred ($200) Dollars for which amount Registered Bonds of the Confederate States of America, bearing interest from this date, at the rate of four per cent per annum, will be issued to him, under the "Act to reduce the Currency and to authorize a new issue of Notes and Bonds," approved February 17, 1864, upon the surrender of this certificate at this office. The certificate was signed by John W. Duncan, Depositary. Along the left side, the text repeated the "Four per cent per annum." One wonders if Mr. Dyer received any monetary return for his $200 or did this certificate become worthless. The Confederate states had other monetary vehicles as well. For example, Louisiana printed several state notes during the Civil War years. "The first Louisiana State note of the Civil War issued by the Confederates indicate that they originated from the capital at Baton Rouge and were printed by Douglas in New Orleans. This was just a few months before both New Orleans and the eastern half of Louisiana were occupied by Northern troops. "Regardless of where the currency was issued, the notes of Louisiana indicate that they will be paid 'Twelve months after a definitive Treaty of Peace between the Confederate States and the United States.' There generally remained some civility of this nature on Confederate currency. This particular $20 note included a bust of General P. G. T. Beauregard, printed in black with red overprint and had an ornate blue back. The plate letters ranged from A to K.
The black band across the top included the "Twelve months..." line. On the left, the black band's text read "Receivable for sales of public lands and for all public dues." On the right, the band stated "Receivable for all state, parish and municipal taxes." On the bottom, the text was "For auditor" on the left, "B Duncan Columbia SC" in the center and "For Treasurer" on the right. This example was neither numbered nor signed. Generally, a number was handwritten in the blank area to the right of "Twenty dollars." Also, two signatures would be placed on the lines at the bottom, one on the left above "For auditor" and one on the right above "For Treasurer." So, the question is did this note see circulation or was it part of a Louisiana bank's ephemera after the war? Next on our tour is a Mint Error coin from the Philadelphia mint of 1852. 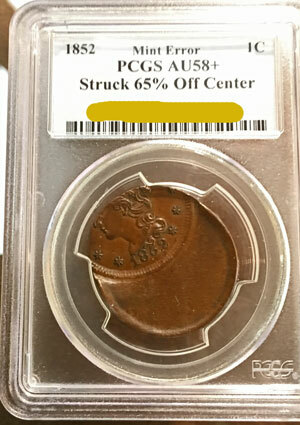 This large one-cent coin was graded by PCGS error experts as AU58+BN Struck 65% Off Center. The US Mint struck over five million of the 1852 large one cent coins. Today, PCGS estimates the survival rate in the brown category as 8000 over all grades. "Off-center coins are one of the most common and best known types of errors. This happens when a blank which is supposed to be fed into the press, lands in the collar improperly. When this occurs only part of the blank is between the upper and lower dies. When the dies strike the blank, only that part will be struck with a design." Similarly, PCGS CoinFacts states: "off-center-a coin that was not perfectly centered when it was struck. Off-center strikes can range from minor to extreme." 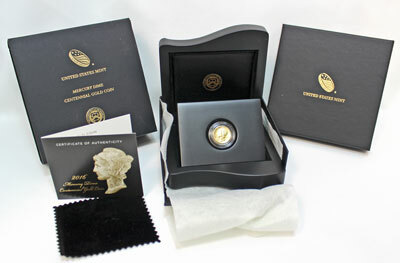 The value of mint error coins considers many of the same aspects as regular coins with the addition of the type of error. The error coins achieve higher value based on the more unique the error and how extreme the error is. Of course, the value is also is also in the eyes of the beholder. Mint error coins intrigue most collectors, and some are willing to pay premiums for those errors. This next coin is another off center mint error but only at 35%. 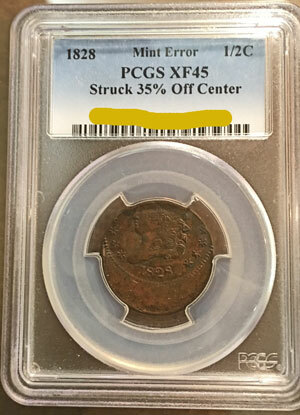 An older half cent coin, this mint error is the 13 stars variety and has a PCGS grade of XF45BN . The US Mint struck 606,000 of the 1828 half cent coins counting both the 13 stars and 12 stars varieties. Of those, PCGS estimates 3000 of the brown variety have survived the past 189 years. Obverse: Hair is well detailed. Wear shows above and below LIBER, and on parts of the head above RTY. Stars are sharp. Reverse: Light even wear on high points of leaves and ribs above H. Bow and ribbon are slightly worn. Since the top of her head does not exist on this coin, the grader had to focus on the stars and the visible hair. Regardless, this is an interesting example of the early Philadelphia mint's processes and results. Traveling through time to over 100 years later, the Denver mint struck the next mint error coin. PCGS graded this example as AU55 with 12% off center. For this coin and year, the Denver mint produced 6,772,000 coins. Currently, PCGS estimates 15,000 survived over all grades. Obverse: Only a trace of wear shows on highest points of hair above forehead and in front of ear. Reverse: A trace of wear shows on the horizontal and diagonal fasces bands. Surface: Three-quarters of the mint luster is still present. In general, this is a beautiful coin but not very expensive without the mint error. 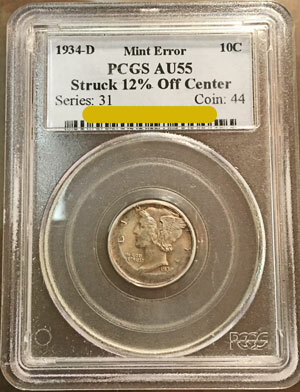 The mint error certainly adds more value especially to those who enjoy researching, understanding and owning error coins. 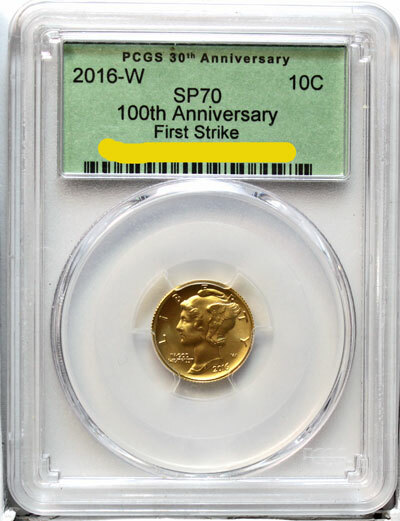 The next coin is another Winged Liberty Head or Mercury Dime, but it is a special strike in gold to commemorate the 100th anniversary of the coin's introduction. Here are two versions, one graded by PCGS as SP70 (Specimen 70) and the other as a set distributed by the US Mint. Looking at the coin's specifications, this special strike is somewhat smaller in diameter than the original yet it weighs more. The silver Mercury Dime weighed 2.5 grams, composed of 90% silver and 10% copper, measured 17.9 mm in diameter, had a reeded edge and was minted in Philadelphia, Denver and San Francisco. It contained 0.07234 ounce of pure silver. The gold Mercury Dime weighed 3.11 grams, composed of .9999 gold, measured 16.5 mm in diameter, had a reeded edge and was minted at West Point. It contains 1/10th troy ounce of gold. The designer, of course, was Adolph A. Weinman. "The reverse shows a design of the bundle of rods with battleax, known as 'fasces' and symbolical of unity, wherein lies the nation's strength. Surrounding the fasces is a full foliaged branch of olive, symbol of peace." Whether in silver or in gold, the Winged Liberty or Mercury design remains beautiful and true to the designer's intent. Visit the show next month to view, buy, sell or trade among similar and different collectibles. The dealers and their showcases provide a wide variety of coins, currency, bullion and other collectibles. Due to hotel scheduling, the next show will be down one level in the Lyon, Sanford and Cole rooms. There will be plenty of dealers and plenty of space to move about and browse among the many treasures. Join us on Sunday, October 8, 2017, for the next Greater Atlanta Coin Show.